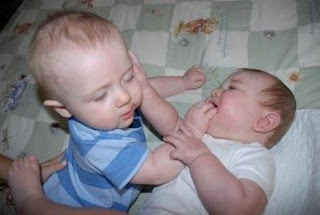 I had my first encounter with cage fighting when I was about a year old. I stood in the corner of my cage, each hand grasping the top of the adjacent railings to my left and right. I stared at my opponent and screamed. He, in the opposite corner stood, with eyes wide open, cowering. I could smell the fear on his breath…or perhaps it was the smell of Enfamil…hard to tell. My opponent being 14 months older than myself was still no match for me…I had a diaper and I knew how to use it. My brother and I shared a cage for the first year of my life…then I became the victor…I owned the cage...and had it to myself. My second encounter with “Ultimate Fighting,” was in college. I had been approached by a friend, from high school, who had earned himself a black belt in the fine are of Karate…it’s always more fun to pronounce it…car-rot-tay…try it…see what I mean? He had begun to transition into some jujitsu training and asked for my help. I assumed that this was because of my athletic prowess…but, after the fact, I think it may have had something to do with the fact that he wanted to punish me for dating his sister. I do believe that his hope was that, I, as a wrestler, would be able to provide him with a different style of sparring compared to his normal martial arts partners. We worked out in his basement, in which he had mats laid out from wall to wall. After a little workout on our feet with takedowns…we took to the mat where we began sparring in efforts to make the other person “submit.” There are pretty much two ways to get someone to “submit”…or “willingly quit.” #1. Generate such legal pain that the other person begins whimpering, sniveling, crying for their mother, or they become deathly afraid of breaking a body part. #2. Pass out. We sparred for about an hour and a half each creating submissive situations with the other. I used my wrestling to create submissive leg locks (illegal in wrestling…but not ultimate fighting). While he worked chokeholds on me…making me whimper, snivel, cry for my mom and afraid eyes were going to pop through my nose…I know…that’s not realistic…but it sure felt like something was going to pop…so…my ultimate fighting career ended after about an hour and a half of training. I think submission is interesting. The Greek word for submit is hupotasso, which is actually two Greek words, upo and tasso. Upo in the Greek means “to place under,” while tasso means, “to put into order.” So in the Greek culture the word, hupotasso, would refer to putting yourself under the order of another. It would often be used in the context of the military, whereas, soldiers would be put, or would place themselves, “under,” the rule of the authority placed in their lives. Ephesians chapter 5:21-6:4, sets the stage, for some amazing scriptural imagery of submission. The entire book of Ephesians has been painting this picture of unity that God creates in people who choose to follow him, and how a sign of spiritual maturity is, in fact, unity. We also see how as we become “mature” followers of Christ, purity should follow, and our lives should begin to look more and more like the character of Jesus. Now, while understanding this “unity” in the Body of Christ, we see Jesus call his followers to “submit” to one another. Talk about counter cultural. While we live in a culture that cries for justice and fairness…we see Jesus call us to submission. Jesus calls us to say…”I am willing to be second.” What would our culture, our country, our world look like…in the spirit of submission? So my son and I were planning on heading up to northern Minnesota recently to do a little grouse and squirrel hunting. We woke up early and made our way out to the truck at 6:00 a.m. while it was still dark to get a chance at some of those early birds. After we had loaded the truck…we climbed in…I turned the key…only to find that the truck would not start. I turned the key…the starter would engage and the engine would turn over…but there was no sign that the engine even wanted to attempt to run. I knew I was low on fuel, so it seemed a simple solution to get some gas and try it again. I grabbed my empty gas cans and threw them into my wife’s van…ok…not true…I gently placed them into the van so as not to spill any drops of residual fuel. (Also, I am sure someone will take issue with the fact that I called it my wife’s van…as if it’s her responsibility to take care of the kids because the minivan is a mom’s vehicle…it’s not just a mom’s vehicle…grandmothers can drive them too…I’m joking…I’m joking…although it is true). In any case…wouldn’t you know it…the van wouldn’t start….battery dead. I have come to the discovery that when children play in a vehicle…and leave the lights on and doors open…it drains the battery…weird huh? What does it take for children to learn this?...maybe if I took away their iPad charging cables they would come to realize that batteries go dead when there is no source to charge them. Anyway, I put the charger on the van battery…about 15 minutes later…we are heading to the gas station…we get the gas…we bring it back…put it in the truck…truck still won’t start. It is becoming rather obvious that I have bigger problems with the truck than just being out of gas. After 2 hours of struggle, my wife graciously offers us to use “her” van…yes…I said it again! But seriously! It’s ok! She likes “her” van! It has heated seats! While my son and I are gone…all I can think about is, “What am I going to do with the truck when I get home?” I find myself hoping beyond hope, that I will arrive home and have found that the truck has somehow “fixed” itself. So, after chasing one bird, and killing one squirrel, my son and I arrive home, and the first thing I do, is to try and start the truck. Nothing has changed. The truck is still broken. It was absurd for me to think that somehow, my truck would have any ability, to repair itself…yet, that is exactly what I had hoped for. Ironically, I find that I treat my spiritual self in the manner. The truth is that I am broken…and as much as I think that maybe I can fix my own brokenness…I can’t. In fact, it’s absurd for me to think that I can. How many times have we struggled with sin…you know…the sin…that one sin that keeps rearing itself in our lives…gossip, hatred, lust, infidelity, drunkenness…the list goes on…and just when we think WE have achieved victory…there it is again…and we find ourselves once again at the bottom of the pit of self hate asking, “why can’t I stop?” Well…it’s because we can’t. We cannot fix our brokenness. It’s silly to think that we can obtain purity without Christ…yet, we are called to a life of purity…so what choice do we have…but Jesus. Our choice boils down to just two options. #1, stay broken. #2, Ask Jesus for help. He promises that he will fix our brokenness…and lead us into purity. Ephesians 4:17-5:20 is filled with the call to purity, but, in the midst of the call is Christ. Christ, who calls us into purity, leads us to purity and longs to make us to look more like him. My truck has been repaired. I performed what is called the "dump truck" method to access the fuel pump. 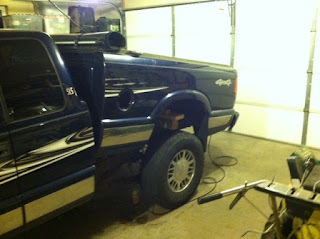 Though my truck is up and running...I wish I found the repairs to "my brokenness" coming as simply. That however, is not the case...but, the Lord uses the journey through my brokenness to bring about greater character in me...which begins to look more like His. It's His work...not my own.